Proving negligence is a key element of any successful personal injury claim. When you've been injured as the result of an accident caused by a truck driver, evidence of negligence can come in several different forms. In addition to placing limits on the number of hours that drivers can be on the road each day, the Federal Motor Carrier Safety Administration recommends drivers take a short nap of between 10 and 45 minutes if they are feeling drowsy. However, drowsy driving accidents are still common among truck drivers. One study by the Large Truck Crash Causation Study (LTCCS) found 13% of truck drivers reported being fatigued at the time of their accident. Going 18 hours without sleep creates a level of driver impairment similar to a blood alcohol concentration (BAC) of 0.08%, which is twice the 0.04% BAC level allowed by law for commercial drivers. A drowsy driver is just as negligent as one who has had too much to drink. Distracted driving can take many forms, but cell phone use and texting while driving are the most common. Dialing a cell phone increases a truck driver's risk of being involved in a safety-critical event by six times, while texting increases the risk of a safety-critical event by 23.2 times. The FMCSA forbids commercial drivers to use handheld cell phones to make a call or dial by pressing more than a single button. Drivers are only allowed to use hands-free cell phones located in close proximity. Sending or reading text messages is forbidden under any circumstances. Truck drivers who break these rules will be found at fault for any resulting accident. The trucking industry has a fair amount of turnover, especially in long-haul positions that require the driver to be away from his family for weeks at a time while delivering cargo. Because of this, driver inexperience is one of the leading causes of accidents. Inexperienced drivers may incorrectly load cargo on the truck, leading the semi to jackknife or making it extremely difficult to maneuver. Novice drivers often have difficulty navigating sharp turns or heavy traffic conditions as well. When there is evidence that a truck driver has not received the necessary training to safely operate a commercial motor vehicle, his employer can be held liable for the damages that result. Rain, wind, fog, and other poor weather conditions can result in accidents, especially if a truck driver is speeding or following another vehicle too closely. Inexperienced truck drivers are most likely to cause weather-related accidents, although even commercial drivers with many years of experience can make judgment errors that result in a collision. Although nobody can change the weather, truck drivers have a legal responsibility to do what is necessary to ensure the safety of those on the road. If the weather conditions indicate it is unsafe to continue driving, FMCSA guidelines say truck drivers should pull over and wait until the weather improves. Equipment problems such as tire blowouts, brake failure, or power steering difficulties can cause serious truck accidents. Equipment problems may be a sign of negligence in three separate areas. The driver could be negligent if he did not perform the required pre-trip inspection or did not properly report any problems to the owner of the vehicle. The trucking company could be negligent if they knew of the equipment problems and failed to make the necessary repairs. The mechanic could be negligent if the repairs were ordered, but were not performed or were done incorrectly. Lining up the documentation necessary to prove negligence can be time-consuming, but an experienced personal injury lawyer can handle all this research on your behalf while working to negotiate the highest possible settlement. If you’ve been injured in an accident with a semi truck or other commercial vehicle, the experienced lawyers at Rechtman & Spevak can help. Please reach out to us using our live chat function to learn how we can help you. You can also submit a contact form here. 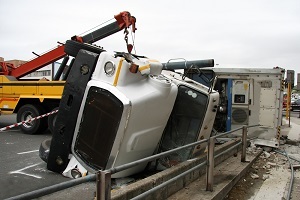 Commercial Truck Rollovers: How Do They Happen? Who Is Liable for Damages?